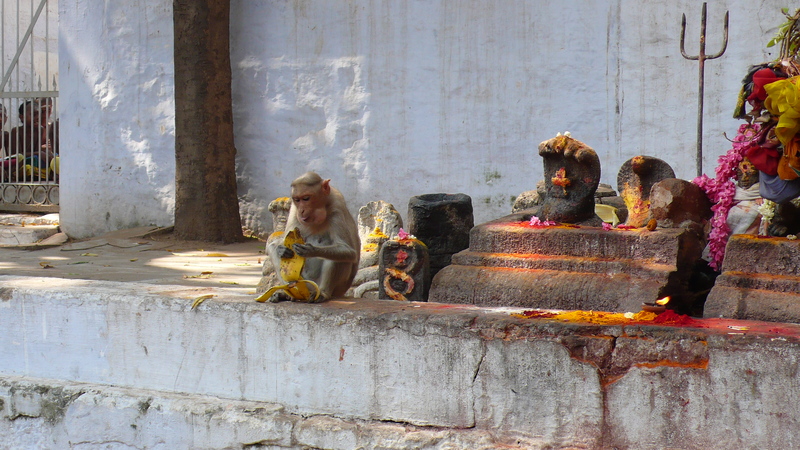 Well-positioned monkey in line to receive offerings, Tirupparamkunram temple, Madurai. The tip of the subcontinent. 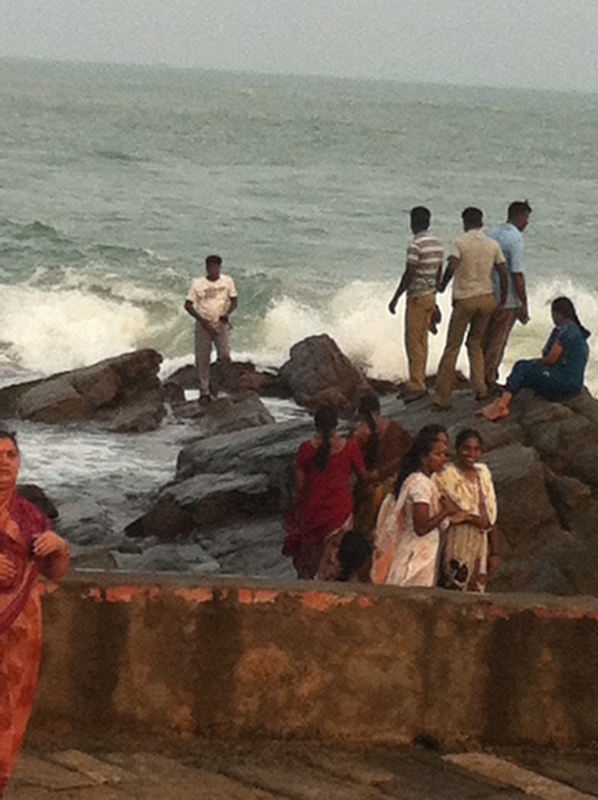 We reached the southern tip of India, where the waters of three seas swirl together: Arabian Sea, Indian Ocean, and Bay of Bengal. The highway just goes right to the water and then stops. 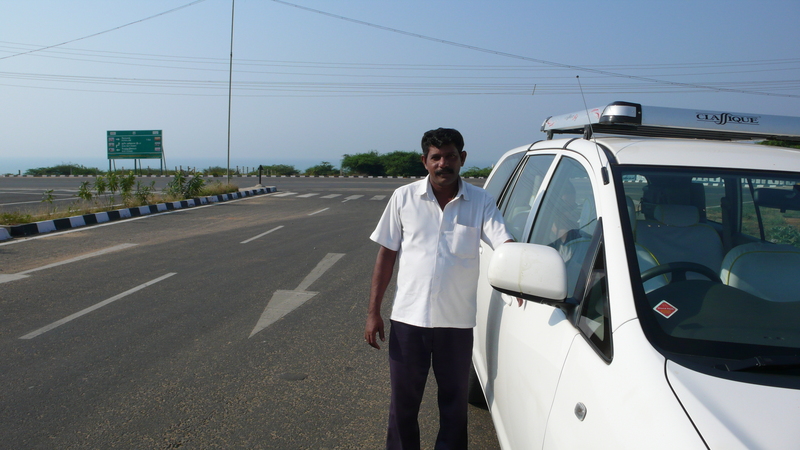 Here is our driver Vinayan at the end (or beginning) of the road. That arrow points north. When you approach the tip of a pointy continent it is not just the waters that meet. 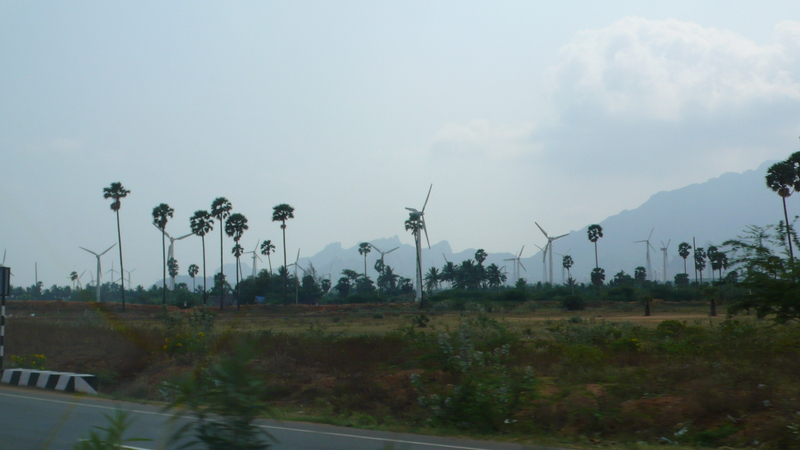 Wind comes from all directions, and the Indians are harnessing it. The tip of the continent is a major pilgrimage destination for Indians from all over the subcontinent. 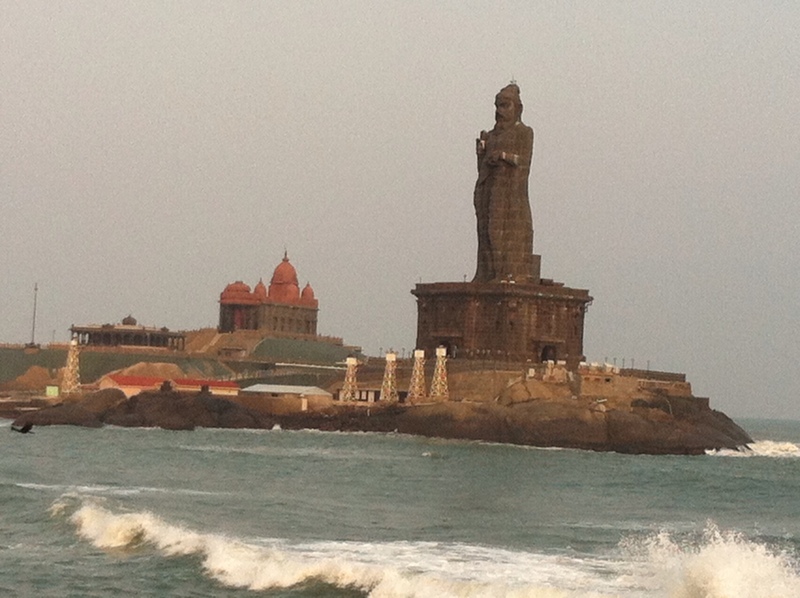 The great statue of the legendary Tamil poet Thiruvalluvar (his dates range from 2nd century BC to 7th century AD) occupies an island directly facing the tip. 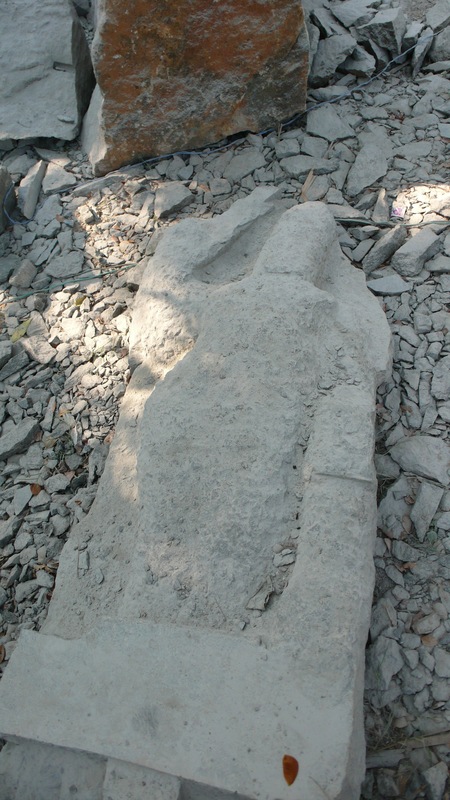 The colossal statue was unveiled on January 1, 2000, though soon it will be forgotten just how new it is. On the island next to it is the memorial to Swami Vivekananda, a late 19th century guru, who swam to this island and had a moment of enlightenment. That building was unveiled in 1970 (!!). 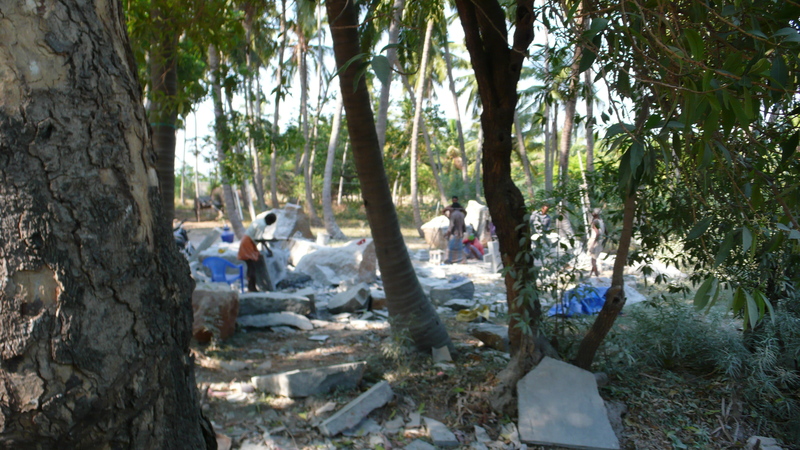 Ghandi also came here and meditated for 3 days, and his memorial is also on the water, in the other direction. 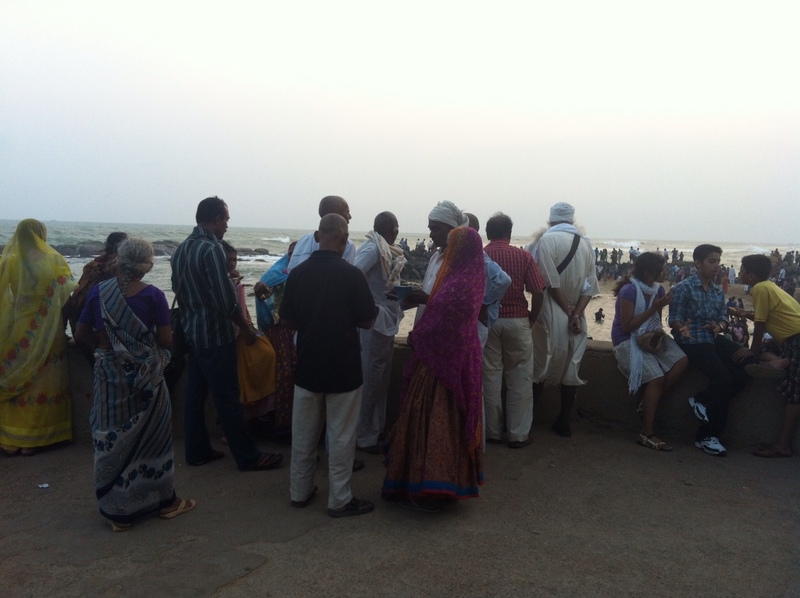 Among the crowds gathered at the water (many of whom plunge in for a three-ocean cleanse), we discerned different northerners: Rajasthanis, Kashmiris, and Punjabis. Everyone was in an excellent mood. 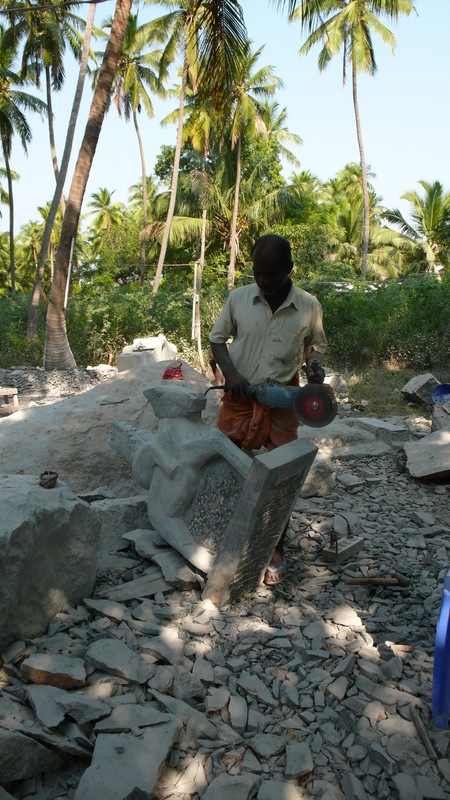 Making temple statues with power tools, Kerala, India. 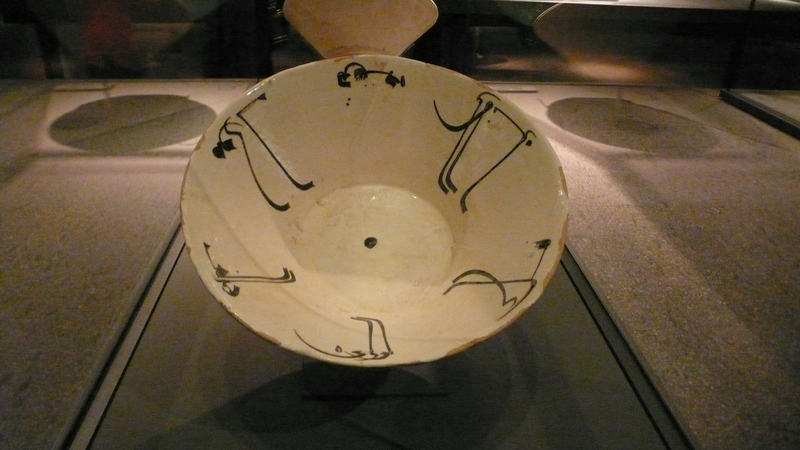 The use and display of works of art in India work against the earnest art historian. 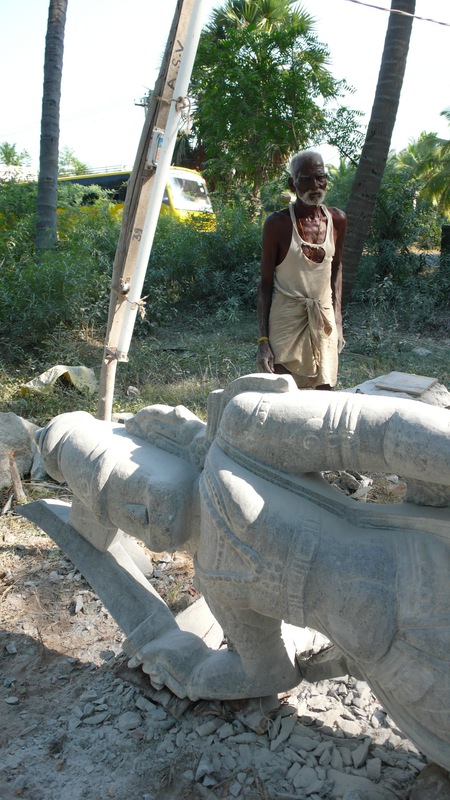 Ancient statues are doused in oil and pelted with ash, but sometimes they aren’t old at all. Types persist over centuries, making it difficult for all but the experts to date them even within spans of hundreds of years. So imagine my joy in looking out the car window and seeing a real workshop in full swing. Excuse the blur but I just glimpsed it. Stop the car! Let’s say hello to the craftsmen. 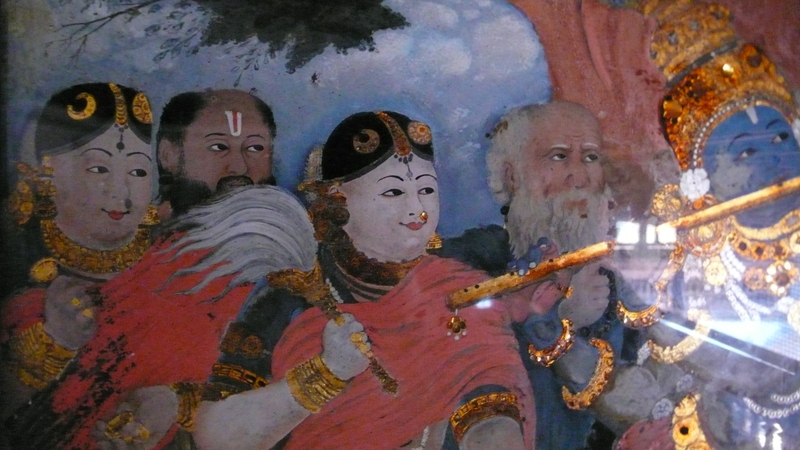 Here is a charming detail from an 18th century painting on glass in the palace at Trivandrum, India. It is a dissertation waiting to be written! Here is a nudge towards a thesis. Only the Christian churches looked like this. It was a distinct phenomenon. It was as if they were saying, look how different we are from the dark Hindu temples, which accumulate unfathomably over time, their sculptures layered with oil and ash and perfume. 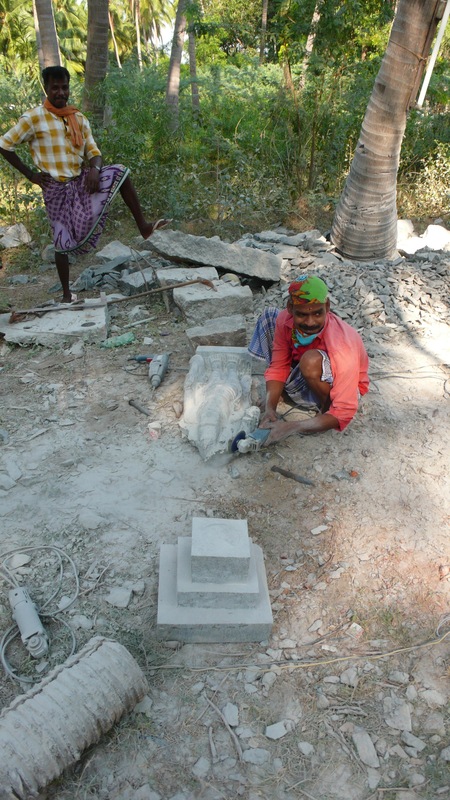 I heard more than once that the Christian faith, with its message of the importance of every human soul, has attracted many people from the lower rungs of society looking for an escape from the Hindu caste system. These clean, upbeat, modernist buildings carry a message: you can keep going to the traditional Hindu temples with their layerings, repetitions, and rituals, and never see change, or you can come to the Church, fresh and clean, and come into a new life. 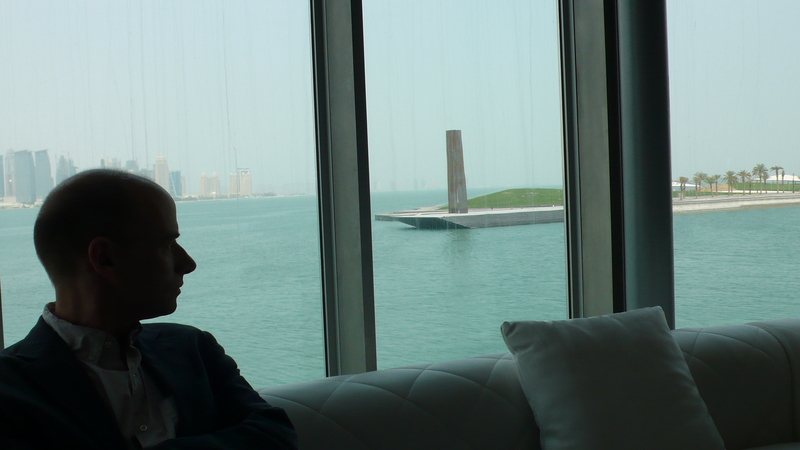 These towers along the main bay of Doha all went up in the last ten years. 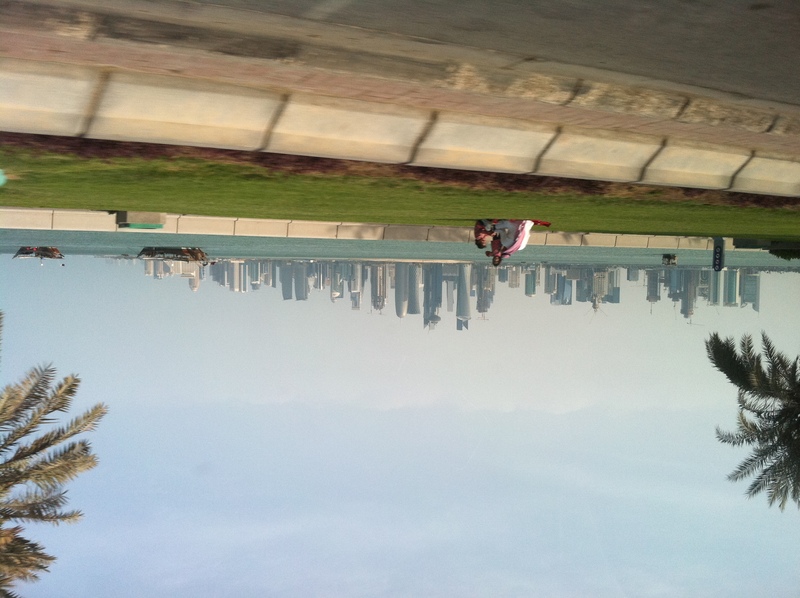 Qataris are quite used to them and are happy to drive their shiny SUVs through them. 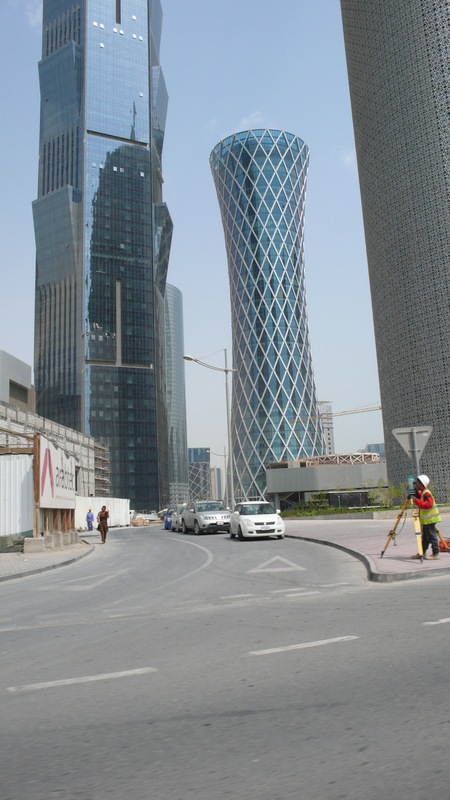 But the Qatari government also understood that people need places to congregate in. To spend leisure time in (there is a lot of it here). On foot. And not just malls. So they have created two major and hugely successful traditional spaces: an “old” souk and a sort of waterfront area with galleries, restaurants, and even an amphitheater, called Qatara. The thing is, people really use the new old souk. It is not just a touristy thing. We were in the minority. People enjoy the personal shopping and the local flavor. Locals enjoy sitting in the nearby restaurants smoking a shisha and gossiping (as I imagine they were doing). In one sense they are tourists in their own land: they too want to know what it’s like to sit in a souk. I smoked a shisha and did some gossiping too. That thing that has been happening in souks since time immemorial was happening here: locals and foreigners rub shoulders. (They don’t in malls.) 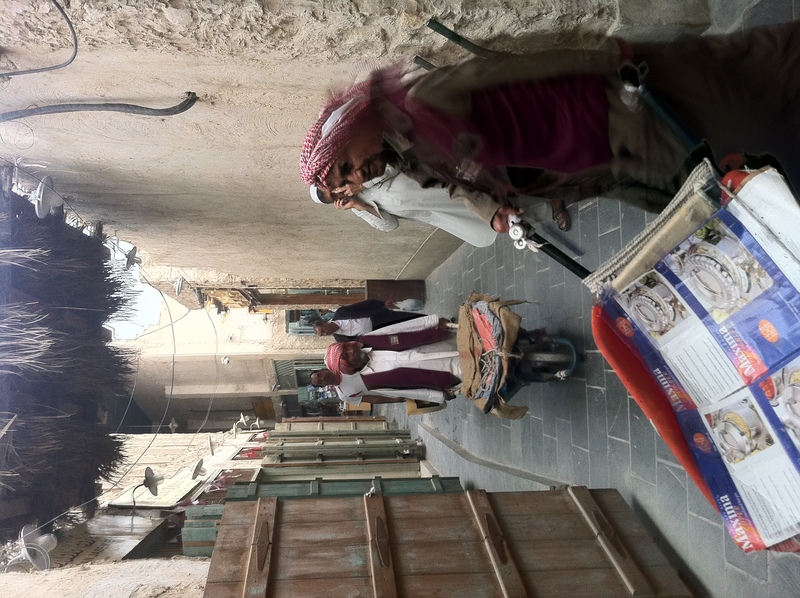 It was the same with Qatara: in the evening the place was awash in locals promenading with their friends and families. It doesn’t matter that these are ersatz “old centers.” If you look closely at any “authentic” souk, say the gold souk of Istanbul, all its parts have been renovated at one point or another. It has electricity now. All functioning souks are new antiques. By that logic you can just invent one out of whole cloth. If you put the right shops in it and the people really come, you’ve got a souk. Give this a few years and it will be as authentic as any in the Middle East. This is what is lacking in Abu Dhabi. Man lives not on SUVs and malls alone. If you are inventing whole cities out of the desert, you need to (re)create the traditional spaces too. Otherwise the city never quite comes together.